Adrian Wojnarowski is reporting that Chauncey Billups, Detroit's favorite son, is returning to the Pistons on a two-year, $5 million+ deal. He of the trade for Allen Iverson that Pistons fans refuse to understand, Billups has bounced around the league since leaving Detroit, landing first in his hometown of Denver before heading to the Knicks and eventually the Clippers. Billups is in the twilight of his career and will undoubtedly retire as a Piston now. The theory behind this signing is obvious: Brandon Knight has struggled to develop in his first two years, so bringing in a veteran point guard to mentor him could be valuable. Billups struggled to find his niche before he came to Detroit to act as the floor general for a team of talented veterans who eventually won Detroit a title in 2004. But that was then. In 2013, Billups has spent his last two years as an oft-injured shooting guard in serious decline. 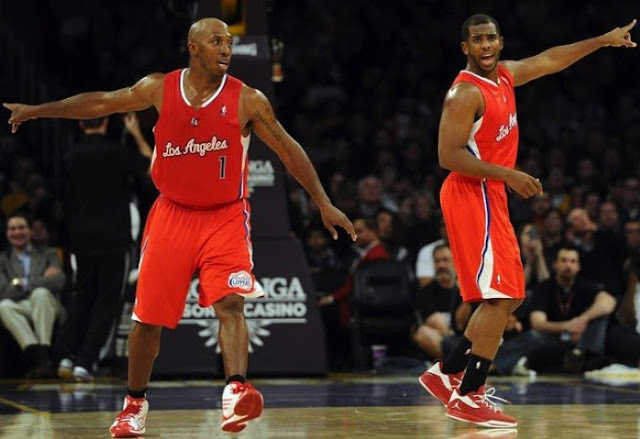 Chauncey was brought to the Clippers as an affordable, undersized shooting guard option to flank Chris Paul (who was yet to be acquired) and rising star Eric Bledsoe. Injuries cut both of Billups' seasons with the Clippers short, playing in only 42 games over the past two years. Most notably, an Achilles tear sidelined Billups for most of the past season, an injury similar to the one Kobe Bryant suffered in the playoffs and one that has effectively ended many players' careers. In limited time, Billups' numbers have shown significant decline. His points per 40 minutes the past two seasons have been some of the worst of his career, and while his assists per 40 minutes showed similar trajectories, at least those can be explained by his move to shooting guard and pairing with the league's best point guard. What concerns me is his linearly declining rebound rate, which indicates a player whose athleticism is waning. Though he was never a prolific rebounder, Chauncey's size allowed him to overpower smaller guards inside. His rebound rate implies a decline in his abilities, something that is mirrored by his PER, which, last season was a league average 15.00. Billups hasn't played much in the past two seasons and he's played point guard even more rarely. It's unlikely that he plays significantly this season, and his deteriorating athleticism likely hinders his versatility; can he play shooting guard anymore? His stewardship of Brandon Knight's skills will likely have to be verbal, rather than teaching by example. And with Mo Cheeks--a former point guard himself--manning the bench, what value Billups can bring may be limited. Chauncey turns 37 years old in September and is injury prone at this stage of his career. With a roster crunch already affecting the Pistons--this ends Peyton Siva's bid for a roster spot--signing him to a two-year deal works more to restrict the Pistons' options than improve the team. Chauncey will get rousing applause when he steps onto the Pistons' floor during the home opener and indignant fans will applaud Joe Dumars for signing the player they believed was the team's captain and savior. But in 2013, signing Chauncey Billups to a non-contender is a puzzling and haphazard move.